The Red Mountain Lodge -This custom built home offers all the amenities you are looking for during your Breckenridge vacation. 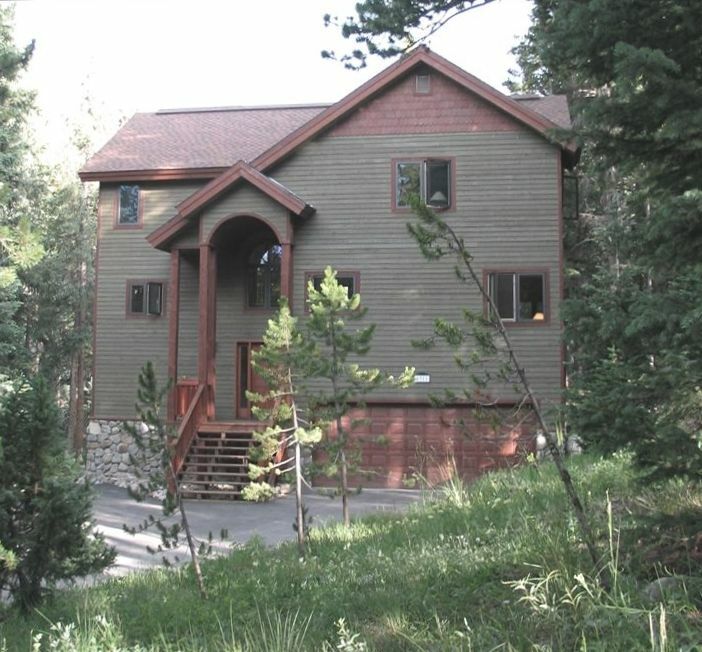 Located just 3.8 miles from Breck, this home offers luxury surroundings in a peaceful location, for much less a night than in town. You get spectacular views of Red Mountain from the deck, hot tub, and the wall of living room windows. This property sleeps up to 14 and is perfect for a large family getaway, or reunion of friends. The 30 positive guest reviews below speak volumes about the quality, space, and location of the Red Mountain Lodge. The Sherwood House has bedrooms and bathrooms on each of the three floors. Each bedroom and bath is set up for optimal functionality and plenty of space. The kitchen on the main floor is fully stocked with everything you will need to prepare your own gourmet meals. Or if outdoor cooking is your thing, we have a BBQ located on the deck. The downstairs has a game room equipped with a foosball table, air hockey table, television, fireplace, and kitchenette. The living room is spacious and open with soaring ceilings, comfortable furnishings, fireplace, and a wall of windows that provide stunning views of Red Mountain. Space, comfort, luxury, location, views, amenities, we have everything you need to make your vacation in Breckenridge into an unforgettable experience. If you are ready for a luxury vacation in a fully equipped mountain home, contact us today! Three Dixon brothers own and built this home in 1997. We spent our childhood living in Wisconsin and made Family trips to the Rocky Mountians every winter to ski. This home was built to continue the tradition of allowing our families to continue that tradition. Steve and his wife Katy reside in Michigan with his family of 3 children. Phil and his wife Janelle reside in Minnesota with his family of 2 children and Joel has been a 25 year resident of Breckenridge and lives with his wife Jill and new born child in a nearby neighborhood to this wounderful vacation home. Our decision to build this home needed to start with the location. Our requirements were a lot that was close and convenient to town yet offered peace and quite from the crowds of the ski resort. Mountian views and easy access to all the activitys that the area has to offer in both summer and winter were also a must. We found our lot in Blue River and construction started. Our building plans started with the need to comfortably sleep all of our families. We wanted to spare no expence in creating a vacation home that was as comfortable as our own homes. For this reason, we designed all the bedrooms to accomidate King sized beds. We also wanted a warm and comfortable environment, so we designed it to have large open spaces with two fireplaces and radient in-floor heat.